The basic method for building a Faction AI script is to first, plan paths for enemy hierarchies, then plan Missions for enemy hierarchies, and then, finally, create a Faction AI that triggers units to begin movement and execute Missions as triggers are met. Now that we have planned all of the enemy paths, and we have planned and canceled the Missions for all our hierarchies, now we are building a Faction AI script. At its heart, a Faction AI script is just a list of triggers, or conditions that must be met, and orders to be executed upon those triggers. As we are building our script, and we begin to test it by running the clock, we will inevitably have to go back to the script and make changes. This topic explains how. Prior to the steps of this topic, we must already have re-opened the Faction AI for editing. 1. 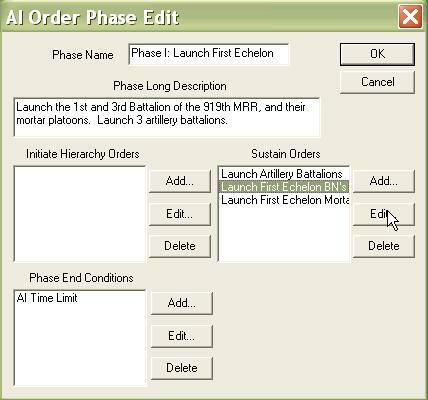 Select the AI Order Phase that contains the phase order you want to edit. 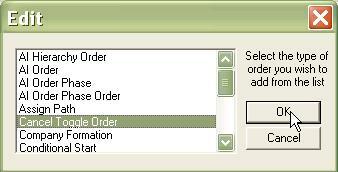 Select the Phase Order from the 'Sustain Orders' which you want to edit and select 'Edit'. 2. 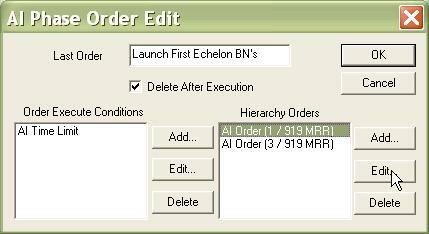 To edit a 'Hierarchy Order', select it and click 'Edit'. 4. 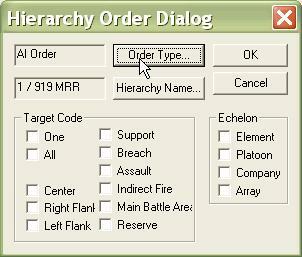 This is why it is always a good idea to have a detailed description of what the Phase Order does in the 'Last Order' block of the Phase Order Edit dialog: The Hierarchy Order dialog will not tell you what the last Order Type selected was. Select the Order Type you want, fill out the appropriate Order Edit dialog, and click OK.
5. If you decide to edit an Event Box condition, you will presented with this dialog. If you do not have the correct Event Box for this condition currently selected, select 'No'! This will preserve the Event Box that was selected when you originally created the Event Box condition.